More and more international students are enrolling at US institutions fueled by stories of elite graduates who were educated internationally and, as a result secured well-paid jobs – and institutions just cannot afford to ignore this demand. 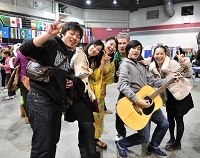 For the seventh consecutive year, the number of international students studying at US colleges and universities grew, according to the Institute of International Education’s Open Doors report released on November 11. Bright students from countries like India, China, South Korea and Saudi Arabia are driving this growth. These students know that a high quality education will help them succeed in a global knowledge economy. But too few institutions are rising to meet this demand. The Open Doors report revealed that international students comprise 3.9 per cent of all enrollments in US institutions. Additionally, just 5 per cent of colleges and universities in the US host 69 per cent of all international students in the US. This disproportionate distribution is concerning. A diverse student body enriches the learning environment for all students, increasing their exposure to new perspectives, cultures and ideas that will prepare them to succeed in today’s interconnected world. The institutional impact is also great. The total number of international students is still growing, but the US is losing market share to other countries. For example, the Organisation for Economic Co-operation and Development’s (OECD) Education at a Glance 2013 report shows that the US hosted 23 per cent of all international students in 2000; by 2011 that amount had dropped to 17 per cent. Reversing this trend will take a concerted effort by all institutions to invest in transnational education. Taking on such an initiative could appear a daunting challenge for some universities. Competing internationally with the likes of the University of Southern California, New York University, Columbia University and the University of Texas may seem an impossible task, especially in the face of other external pressures, but the potential benefits are great. Serving international students offers institutions the opportunity to create a 21st century academic experience, enrich the diversity of a campus and create a new revenue stream – a critical factor given the immense internal and external budget pressures currently bearing down on US universities. Today, the most pioneering universities are meeting these demands with comprehensive internationalization agendas that expand academic and support offerings, diversify revenue, build a global profile and bring global perspectives into their classrooms. INTO’s US partners are shining examples of these efforts and have much to celebrate this year. Oregon State University, University of South Florida and Colorado State University all reported double-digit international student enrollment growth. These institutions considerably outperformed the national average international enrollment growth of 7 per cent. The students at our US partner universities are also performing well academically. Three quarters of students at INTO’s US centers successfully completed a Pathway program and qualified to progress to a degree program. And an impressive 95 per cent chose to matriculate to a degree program at their host institution. At our newest US partner, Marshall University, 170 students from 23 countries arrived on campus this August for the inaugural intake at INTO Marshall. This number is projected to grow to more than 200 students by Spring 2014 and to over 300 students in Fall 2014. Together we are building the capacity at Marshall to serve these students and help the university maintain and grow a global presence. For their outstanding commitment to comprehensive internationalization two of INTO’s US partners were recognized by the international education community in 2013. The University of South Florida and Colorado State University both received the Senator Paul Simon Award for Campus Internationalization from NAFSA: Association of International Educators. For more information about this achievement, see INTO’s press release. Our partners understand why comprehensive internationalization is key to their own growth and evolution. Opening the doors of higher education improves access for international students to quality higher education and helps prepare domestic students for today’s globalized work environment. It is time for more universities to diversify and grow their international enrollments and establish the type of academic programs and support services this cohort needs to succeed. Doing so will not only improve the US universities’ ability to serve the hundreds of thousands of students worldwide who wish to study in the country, but will also help create sustainable knowledge-driven economies for the benefit of all. David is INTO's Managing Director, North America. He previously served as Vice President of International Development for Kaplan and spent several years in Australia as Senior Vice President of Global Marketing and Strategy for Campus Group Holdings. David has an MBA (High Honors) from Thunderbird School of Global Management and a BA in International Politics and Economics from Penn State University.